The Conference brought together representatives of over 180 countries together with observers from intergovernmental and nongovernmental organizations, and the media. 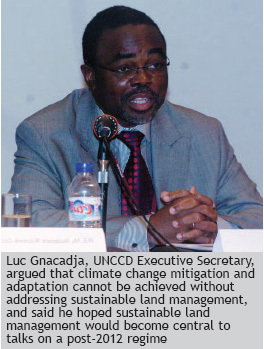 "Sustainable land management is a key issue to address climate change in the post 2012 climate regime. 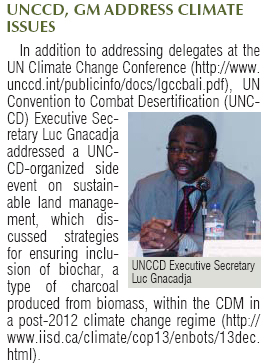 A key item is biochar"
UNCCD Side event at the United Nations Climate Change Conference Bali, 13 December 2007. more.. Harnessing the results in a sustainable loop that enhances adaptation to and mitigation of climate change effort in synergistic ways that also help achieve the Millennium Development Goals. An overview of naturally occurring soil carbon, its depletion and how to redress this trend. The origin of Terra Preta soils and how their replication could have the most significant impact on the achievement of the targets of the World Food Summit.